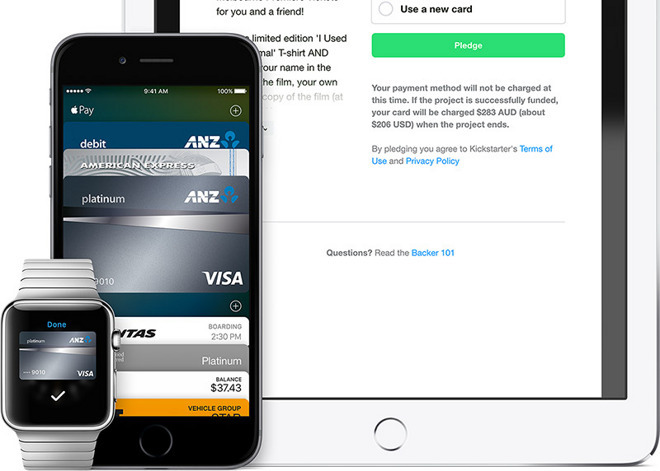 Apple Pay expanded services in Australia on Thursday local time with the addition of ANZ Bank, the first major financial institution in the region to support Apple's payments product after a limited rollout in November. Announced via Apple's website, the new integration comes more than five months after an American Express partnership introduced Apple Pay to the Australian market last year. "Our customers ... are much closer to being able to leave their wallets at home," Apple Pay chief Jennifer Bailey told Reuters in an interview today. She added that Apple is in discussions with other Australian banks and hopes the ANZ deal will spark demand in the sector. When it launched in Australia, Apple Pay was limited to AmEx customers —co-branded cards were not supported —and those retailers with compliant wireless payments systems. With the new partnership, customers are able to provision ANZ Bank-issued Visa credit and debit cards, as well as ANZ AmEx cards. Apple offers little guidance on what customers can expect in terms of future alliances, but the company's website still lists MasterCard as "coming soon." Apple Pay debuted in 2014 with an initial rollout restricted to U.S. customers. Based on the NFC standard, Apple's touchless payments service is marketed as a safe and convenient alternative to physical wallets. Initial hardware support came in the form of iPhone 6 and 6 Plus and has since been expanded to all current iPhone models, including the iPhone SE, and Apple Watch. Following a domestic introduction, Apple Pay went live in the UK last July, later expanding to Canada in November and China in February.